Wall Street: Money Never Sleeps review - In Which Lie Did I Tell?, William Goldman remembers writing a great part for Michael Douglas in The Ghost And The Darkness: a fearless big-game hunter modeled on cowboy Shane and steeped in mystery. But Douglas wanted him to have a past – a history that would get the audience rooting for him. Total Film has no idea if similar pressure was exerted on Money Never Sleeps writers Allan Loeb and Stephen Schiff. Yet there’s no doubt the Gordon Gekko in Oliver Stone’s long-awaited sequel is a very different proposition from the one that won Douglas an Academy Award in 1988. Back then, Gekko was a ruthless master of the universe, a corporate shark who feasted on the carcasses of unwary businesses. Having done an eight-year stretch for securities fraud, though, the GG we meet at the start of Street 2 is a humbled outsider, as redundant as the brick-sized mobile he collects on his 2001 release. In case we’re not feeling sufficiently sorry for the old scumbag, though, Loeb and Schiff also give him a dead son to mourn and an estranged daughter who holds him responsible for her brother’s suicide. Suffice to say that, short of giving him a sick puppy to nurse, they could barely do more to warm us to a character who, two decades ago, was an iconic symbol of vulpine villainy. The revisionism doesn’t stop there. Indeed, if Stone’s film has an agenda, it’s to chasten those irony-deprived Wall Street yuppies who saw him as a role model and his “greed is good” mantra as a code to live by. Had they, like Gekko, spent less time raking it in and more taking care of their families and souls, things might not have reached such a pretty pass. Yet when Street 2 fast-forwards the story to 2008, that lesson has yet to be learned by Jacob Moore (Shia LaBeouf), an ambitious young trader shocked to find his investment bank is going to the wall. Discovering its collapse was engineered by a venal rival (Josh Brolin), Jacob resolves to get payback and avenge the beloved boss and mentor (Frank Langella) whose life it ruined. To do so he forms an unholy alliance with Gekko, whose daughter Winnie (Carey Mulligan) he happens to be dating. Is Gordon simply after a reconciliation? Or is he seeking something else: a return to the big leagues that just might be facilitated through Jacob’s clandestine new campaign? 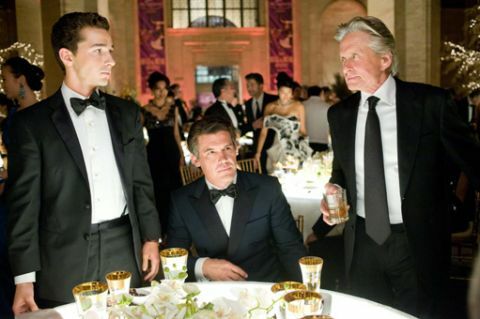 Like its predecessor, Wall Street 2 is a moral fable about an impressionable youth torn between good and bad angels. Here, it’s not Gekko or even Brolin’s Bretton James who is evil. It is more the system itself that’s at fault, something that Stone attempts to convey through a dizzying array of graphics, split screens and factoids on leveraged buy-outs, derivatives and toxic debt. Yet in trying to dramatise the causes and consequences of the 2008 collapse, Stone slightly misses the boat. What could have been pertinent two years ago has started to look more than a little passé now, a cautionary tale told just a little too late to do much good. Not only that, but the director – always a sucker for powerful individuals – still makes the world of high finance appear slick, cool and readily obtainable. The risks may be higher but they are still worth taking, at least if LaBeouf’s well-cut suits and Manhattan loft lifestyle are anything to go by. What Sleeps needs is some righteous fury and indignation, the kind Stone brought to JFK in his heyday. But like his ageing peers, the director is softer now, and it shows in a coda that plays surprisingly feelgood. In the end, then, it’s the performances rather than the politics that save the day – not just from Douglas, predictably splendid in his signature role, but from his co-stars as well. Both Mulligan (who landed her role without auditioning thanks entirely to her impressive turn in An Education) and Brolin (atoning here for Jonah Hex) bring heft and class to their one-note roles. The former gives Douglas a real run for his money in their tearful confrontation, while the latter plays his Ducati-riding schemer with glee and gusto. LaBeouf, meanwhile, does enough genuine acting to make you wonder why he spends so much time mucking about with Transformers.